The front-wheel-drive Cruze comes powered by a choice of 4-cyl. engines and compares well in its class with regard to features, mileage, ride and handling, interior noise, space and quality. Fuel economy is improved for 2012, and the list of standard equipment has grown longer, especially in the mid-range LT level. 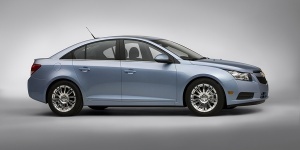 Otherwise, the 2012 Chevrolet Cruze is unchanged from 2011. Find the used Chevrolet Cruze of your choice from a dealer in your area. Search our used car listings now.